It almost feels naive and pointless and quaint to focus on things like “truth” coming from President Trump’s mouth as we limp toward 2019, but just for nostalgia’s sake, let’s hearken back to a time when blatant lies by our commander-in-chief meant something. So, you read yesterday that the U.S. is planning to withdraw all troops from Syria. The pundit class spent very little time on whether this was a good decision or a bad one on its merits—since that question is kind of complicated—and immediately devolved into the “does Russia like this or not?” discourse. 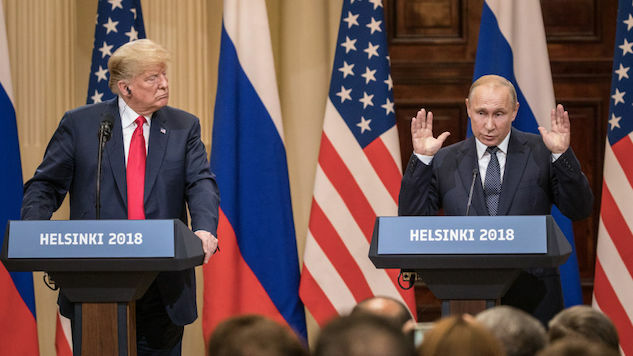 Russian President Vladimir Putin welcomed President Trump’s decision to withdraw troops from Syria—during his annual marathon press conference—suggesting that it was long overdue. There you have it! I mean, it was self-evident beforehand that Russia would be glad to have us out of there, since they see it as a sphere of influence in which we were getting in the way, but now it’s been spoken in plain language by a Man Who Would Know.